Colonial Stores, Inc. was for much of the twentieth century one of the nations largest supermarket operators. At the peak of expansion, the company has had in operation over 500 stores. At the greatest geographical expansion, the company was operating in 11 states, including Virginia, North Carolina, South Carolina, Georgia, Florida, Alabama and Maryland under the Colonial Stores name and in Ohio, Kentucky and Indiana under the Albers and Stop and Shop names. Despite the fact that the company was made up of several organizations that predated the incorporation of David Pender Grocery Company in Norfolk, VA on January 24, 1901, Colonial Stores claims that date as its official founding, and has celebrated 50th and 75th anniversaries accordingly. That founding, 100 years ago, may seem insignificant now, one of hundreds of grocery chains that operated during the twentieth century and have since disappeared, but as we look at Colonial, we shall see that the company is unique in many aspects. David Pender, a native of Tarboro, NC, came to Norfolk, Virginia in the 1890s, seeking his fortune, just as had many young men who had left farms and small towns and traveled to cities in search of their future. Working in the retail grocery industry, Pender soon set out to establish his own store. That store was opened as the David Pender Grocery Company at the corner of Market Street and Monticello Avenue in Norfolk, Virginia in 1900. The store was a success, and Pender incorporated his company in January 1901. Over the next 19 years the store prospered, offering the people of Norfolk the finest in groceries, meats, and fresh produce. A fleet of horse drawn wagons were employed in the earliest years, delivering goods to outlying areas. So great was the trade that in 1919 Pender decided to open a branch store and a location at 619 Colley Avenue, also in Norfolk. Other stores followed, and soon Pender “DP” stores were found across Eastern and Central Virginia and North Carolina. On January 1, 1926, David Pender Grocery Company became a publicly owned corporation , and having built the chain to a total of 244 stores, founder David Pender retired. He would later pursue a career in grocery manufacturing and wholesaling. Under public ownership, David Pender Grocery Company became a subsidiary of National Food Products Corporation of Boston, MA, a company operating under the direction of industry pioneer, Mr. Russell B. Stearns. Pender’s, County and Chestnut Streets, Portsmouth VA. It was under the leadership of Stearns that two food chains owned in part by National Food Products were guided. The second chain, Atlanta, GA based L. W. Rogers Grocery Company, also had a lengthy history in food retailing. L. W. Rogers was a native of rural Maine, who traveled with his wife south to bustling Atlanta in the early 1890s seeking his fortune. In 1892 L. W. Rogers opened his first grocery outlet on that city’s Whitehall Street. >From that single outlet Rogers expanded throughout Georgia and South Carolina in the first twenty years of the twentieth century. In 1926 L. W. Rogers was reorganized as Southern Grocery Company, also under investment ownership of National Food Products. In the early 1930s Russell Stearns was carefully guiding the two chains, Rogers and Penders, with combined buying power and a steady expansion program. 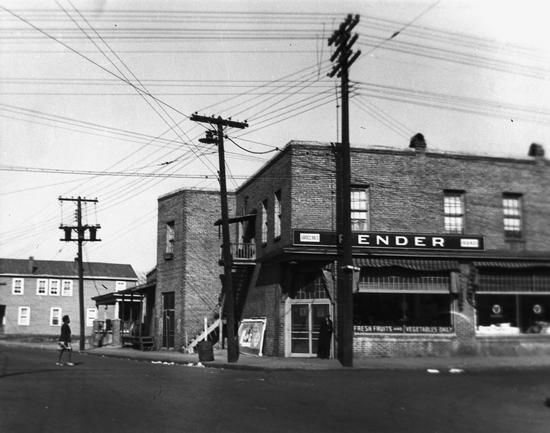 By 1936 it is known that Pender was operating over 400 stores, Rogers well over 100. First Big Star supermarket, later Colonial, West Washington Street, Greensboro NC. It was in 1937 that the Pender-Rogers combination opened their first self-service supermarkets. In December of that year the first two stores, branded “Big Star”, opened in Greensboro, NC and Griffin, GA. These two stores were only the first of many to come. 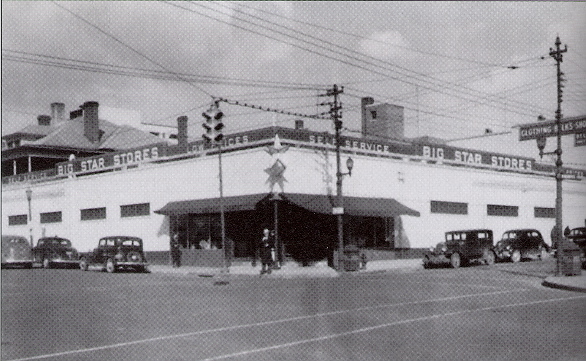 The National Food Products controlled Pender and Rogers chains were combined on December 19, 1940 as Colonial Stores, Incorporated, headquartered in Atlanta, GA. At that time, conventional stores were in operation under the names Pender and Rogers, with some 50 self service stores operating as “Little Star” (smaller neighborhood stores) and “Big Star” (full-line supermarkets). Some listings for stores during World War II show the name Colonial Stores (specifically Washington, NC), but it is likely that listing refers to the corporate owner of the store. It cannot be confirmed that the Colonial name was applied to any store prior to the end of World War II. Shortly after the war, however, the effort was being made to convert more stores from counter-service to self service, and to consolidate under a single name. Colonial, Clairemont and Buford Highway, Atlanta GA, 1955. Georgia State University. On August 3, 1947 Colonial Stores, Inc. introduced their “CS” rooster logo and began converting all of the self service stores over to the “Colonial Stores” name. Company reports indicate that all of the counter-service stores had been closed or converted by 1955, although the latest listings I can find for any Pender store date from 1951, in Williamsburg and South Boston, Virginia and Plymouth, North Carolina. It may be that those final few counter-service stores were also carrying the Colonial Stores name after that time. In June 1955 Albers Super Markets, based in Cincinnati, OH, was purchased by and merged into Colonial Stores. Albers, founded in 1933, owned the oldest trademark that included the words “super market”, having operated self service supermarkets from its inception. At the time of the merger there were 66 Albers stores in operation in Ohio and Kentucky. Later that year, in November, Colonial Stores purchased the Indianapolis based Stop and Shop Companies, operating 14 stores in Indiana and Kentucky. While the Albers purchase formed the basis for successful operations for many years, the Stop and Shop operation was less than successful for Colonial and those 14 stores were sold in 1959. Colonial Stores, in a effort to further secure their future in food retailing, entered into the business of licensed discount food stores in conjunction with discount department stores, opening three such leased departments in 1961. In 1962 this effort was solidified with the opening of a K-Mart Foods leased grocery department in Greenville, SC and a Treasure City Foods leased grocery department in Fayetteville, NC. The following year four additional low-margin, no-frills stores were opened, including the first to be independently operated under the company’s own brand, a resurrected “Big Star” brand. 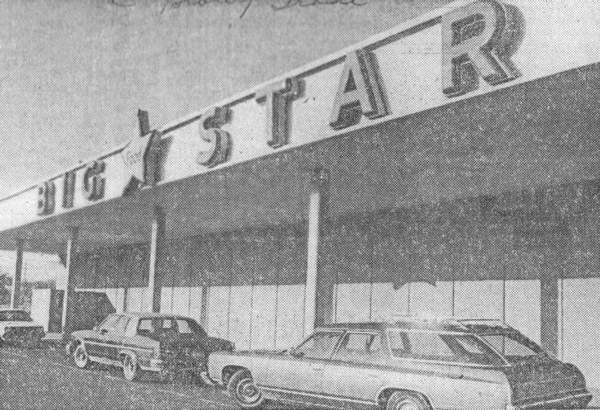 Big Star, former Colonial, later Harris Teeter, Charlottetown Mall, Charlotte, 4 January 1984 (Charlotte Observer). Over the next ten years leased food departments and an ever expanding count of discount Big Star stores would dominate the company’s growth, while conventional Colonial and Albers supermarkets were constantly upgraded and improved. Downtown stores gave way to free-standing suburban and shopping center stores all across the southeast and Ohio. 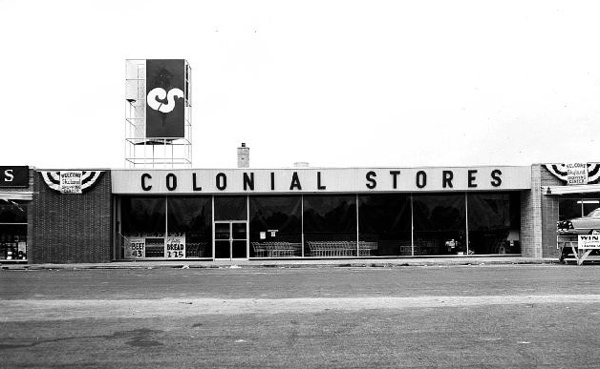 In 1970 Colonial operated 430 stores in nine states. The discount movement had taken a firm hold in grocery retailing during the 1960s, and the 1970s found Colonial competing with A&P “W.E.O.” (where economy originates) stores, Food Town stores, and other discount operations found in combination with discount department stores. In 1974 the Albers operation in Ohio and Kentucky was sold, and many of the existing Colonial stores were converted to the low-margin Big Star operation, so much so that Big Star became the company’s predominant trademark. As best as I can discern, it was 1977 when Grand Union, based in New Jersey, purchased the Colonial Stores operation. Grand Union, primarily a northern grocery retailer, was at that time already over a century old. It seems, however, that the Colonial purchase was the beginning of the end for Grand Union, as the company has been in financial trouble off and on since that time, finally filing for bankruptcy and selling of assets in March 2001. In the first years after the Colonial purchase, however, Grand Union began revitalizing the operation, as the remaining Colonial outlets were closed and the Big Star outlets were upgraded. The Norfolk division, long considered by locals to be the “home” division, was closed in the 1980s, with many of the stores being purchased by the then-expanding Food Town (Food Lion) chain. In 1988 Grand Union abandoned the southeast, with the North Carolina and remaining Virginia stores being sold to Harris-Teeter, and the Atlanta division stores being sold to A&P. Harris Teeter sold many of the smaller and small-town stores to Piggly Wiggly Carolina, Inc., converting the remaining sites to their Harris Teeter name. Big Star survived in Georgia until 1992, when A&P began retrenching, withdrawing from major markets, and closing the remaining stores. Thus, some 95 years after David Pender incorporated his operation, some 104 years after L. W. Rogers opened his first store, one of the great southern grocery retailers was gone. The company had essentially pioneered self-service supermarkets in Virginia, North Carolina, South Carolina and Georgia, and had influenced supermarket development in the other states in which they operated. Abandoned Colonial store sites haunt the strip developments of Norfolk, Charlotte, Atlanta and numerous southern towns as well, monuments to a effort that brought modern grocery retailing to the south. Interesting to read that the company was one of the pioneers of the self-service concept of grocery shopping. My Colonial store of the mid to late 50’s was in Hampton, Virginia at one of the traffic circles on East Mercury Blvd. It was in a strip center and, I can only remember 2 other businesses there; a hobby shop and a locally owned restaurant that treated kids like myself at the time, great. We moved from that area about 1961 and my Mom did her shopping from then on at the Air Force Base. One thing I do remember about her dragging me along was her bill at checkout was always right around $20.00. This was a weeks worth of groceries for a family of four! And, they also gave S&H green stamps which, in our family definitely got used to stretch the family budget. In 1969, as a 24-year-old rookie truck driver, I have fond memories of many of my travels, based in Columbus, Ohio. commissaries, state prison facilities and mental institutions, It was all a great learning experience. I worked for Big Star #1107 in Roosevelt Shopping Center, Norfolk VA from December of 1975 until May of 1981. I started as a bagger and rose to clerk and cashier. We were a union store and I am sure labor costs were a major problem with us competing with other stores like Farm Fresh and Food Lion as minimum wage was 3.31 in 1981 and I was making 8.12, plus time and a half on Sundays. My sister worked at Farm Fresh and was making 3.50 an hour doing the same work… and those stores were crazy busy. We were not very busy due to the prices. One of the things we heard after the purchase by Grand Union was that what they paid for the company was not even the value of our combined bakeries, dairies and peanut butter plants. Our Milk all came from Spartanburg SC, Bread was made in a huge bakery in Norfolk and somewhere in NC was a plant that made private label peanut butter.There might have been a egg hatchery somewhere because we would often get “forced” shipments of eggs in large numbers, only to have to “feed the dumpsters” with them later. The eggs were brought to us in refrigerated trucks but often there was no room in the coolers and we had to leave them in the back room at room temperature. We were told that eggs lasted longer that way ((WRONG)). Eventually those assets were sold off by Grand Union. We were also forced to take massive amounts of bread from the company bakery which was about ten minutes away, so we hit bad with it sometime. My store closed at 6PM on Sunday and often bread was ten cents a loaf on Sundays because we had so much of it. the regular price was 3/1.00 which was still a deal at the time. I was in college and did not mind being “shared” by different stores that needed extra help, especially in the summer when I could work 60 hour weeks and everything over 40 hours was time and a half. So I worked at several of the much older Colonial Stores like Chesapeake Blvd in Norfolk and First View Ave in Norfolk’s Ocean View section. I remembered that one as a child as it was close to my grandparents home. It replaced the DP Store (David Pender) at W. Ocean View Ave and Chesapeake Street in the 1940s… and had a parking lot on the roof. But there was always a chain across the entrance to the roof parking when I was a child in the early 1960s as the roof parking was considered dangerous at that time. That store was replaced by a new Big Star in July of 1977 across the street in the new Ocean View Shopping Center. I helped set up that store and worked there off and on as they needed me for several years, but #1107 was always my home store. I left Big Star in May of 1981 and went to Farm Fresh as an assistant manager. In 1983 I moved to GIANT Open Air Markets and low and behold… I ended up back in Ocean View at the GIANT that had taken the place of the 1977 Big Star that I had opened six years earlier. Years later, Farm Fresh bought out GIANT and I was out the door… as they purged all former Farm Fresh managers that had left them over the years. I left the grocery industry in 1988, but once a grocer, always a grocer.